Probably not the most appealing reference to a bathing ritual, but what may look like your bog standard “lady bath,” is a time honored, sanity maintaining tradition that spans all of my mum’s years. For as long as she can remember, she’s loved baths and all of its trimmings and so it’s no great wonder why she’s meandered her way into aromatherapy. So what is Soup Day? Soup day is a bathing ritual that can last two to three hours of a Sunday (not always) wherein mother is incommunicado, and woe betide the person who knocks before those hours have been spent. Anger in fairy tale grizzly proportions. This ritual for well-being incorporates an impressive array of candles and bathing products, a music playlist (I made one that we share on Spotify *cue the awwwws*), maybe a book, maybe not. The ultimate form of me time where a little magic happens that settles the Universe for Mammy. It’s a running joke in our family that if Mum is having a crap week, the culprit is not having had her weekly soak and we have yet to be proven wrong. 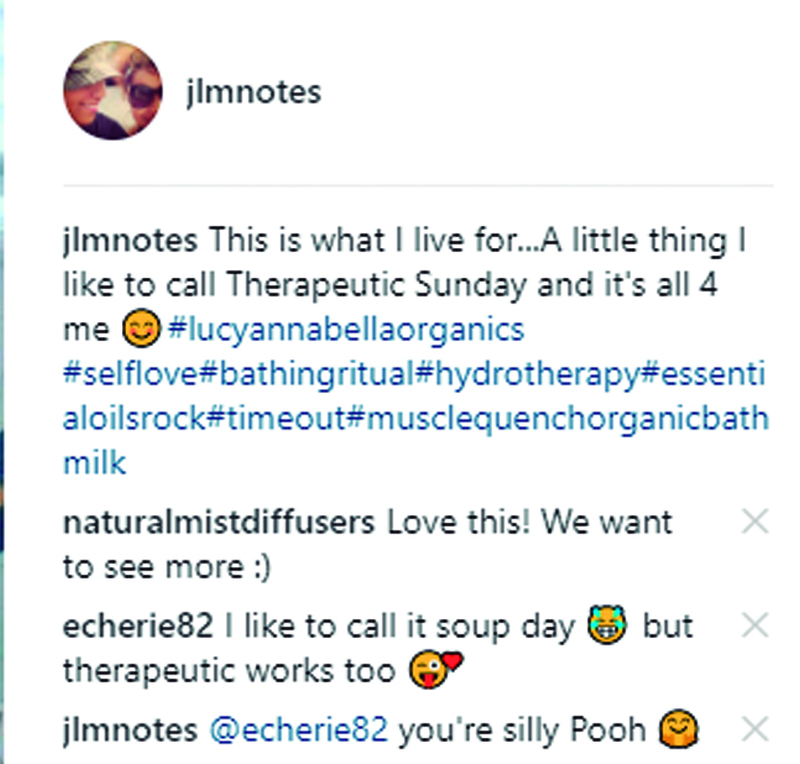 Mum’s ritualistic bathing has kept her skin soft and radiant, has gotten her through depression, has kept her from Lifetime Movie-ing with her family, and has no doubt planted the seeds for the life she’s building now as she “mad scientists” her way through essential oil blends and charts out a career full of scents and wellness. We all have a better week if Mum’s had her stew and if she hasn’t, she can be placated with “we’re sorry, you should soak” gifts of bath products and a promise that we won’t impede the next one. However, the bathing ritual is not just about the getting clean (she does that all week, I can assure you), or the temperature of the water (people have expressed concern that it would be cold if she stayed in that long), or that it’s a bath and not a shower (she’s taken many a crappy bath). A series of steps she takes to ensure the space is set on peak relaxation. It’s time she’s allowed herself to switch everything off and time we respect is hers and carve out space to ensure she gets it, as much as possible. You know how very easy it is to forget about ourselves in the rush of life and not recognize, or follow, those habits that actually support our well-being. So this post is a salute to Soup Day. Keeping Mum sane and savvy since 1982 and long before. Do you have a Soup Day Ritual, too?